Double Dog Dare is a comedy caper with all female leads. Set in a high-rise casino in Biloxi Mississippi, the complications keep coming throughout. First, Davis’ sister Meredith and her best friend’s dog are kidnapped by her hometown preacher. Then the best friend’s mother-in-law comes to make sure that the one million dollar ransom is paid. She might also be a witch. How will Davis and Vree find a million dollars? It helps that Davis in part of a four-person security team in the casino and also a computer expert. Oh and she is also a mother of infant twin girls and has a husband who is luckily out of town. This is literally less than 10% of the hilarious plot. It just goes downhill for Davis, but uphill for comedy caper fans, from there. 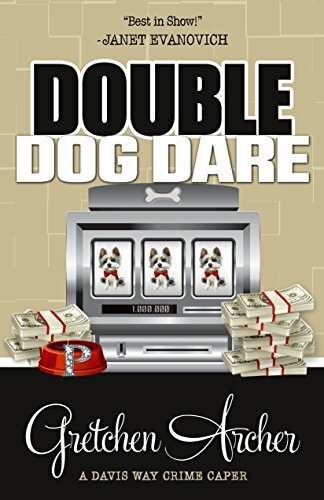 Double Dog Dare is the 7th book in the Davis Way Crime Caper series. I haven’t read any of the previous books and had no trouble following the plot and characters in this one. I chose this book on NetGalley because of the quote “It’s ‘Best in Show’” by Janet Evanovich, whose Stephanie Plum series I love. This book gave Stephanie a run for best comedy caper series (though Ms. Archer should add a Lula-esque character to this series too). Overall, this zany book is highly recommended. 4 stars! Thanks to the publisher, Henery Press, and NetGalley for an advanced copy.